Persistent rate increases in the United States may be having very negative impacts on the global economy. When well over 100 nations see the value of their currencies drop it is highly unlikely that the United States can pursue its economic goals unaffected. If the currency of a nation declines meaningfully over a sustained period, it creates significant problems for that nation's economy. Currency exchange values are displayed in the buy-sell board of a bureau de exchange in Buenos Aires, on August 31, 2018. 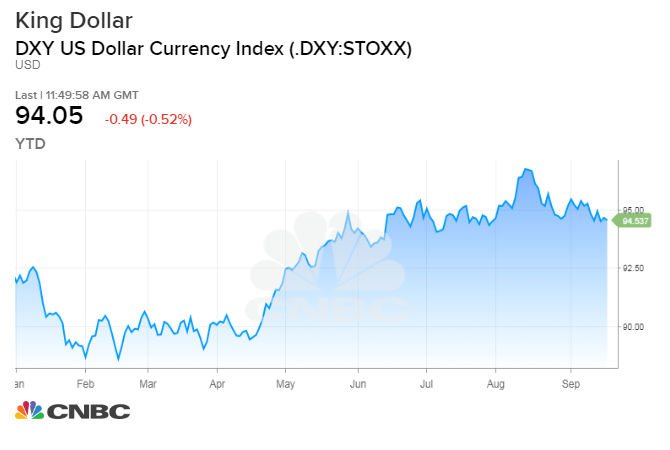 - Argentina's peso began to recover on Friday as markets opened, making a tiny 0.68 percent gain after losing 20 percent of its value against the dollar over the previous two days. The reason for these declines would appear to be the differing monetary policies of the United States and most of the rest of the world. The United States is experiencing solid economic growth and some signs of inflation. This has led the Federal Reserve to raise interest rates seven times in the past 22 months and it has nurtured the expectation that there will be 5 more increases in the next 15 months. Other nations who are not experiencing solid growth are pursuing differing policies. Some are maintaining interest rates at low levels. There are nations like Germany and Switzerland that still have negative rates in some cases. Plus, many nations are unwilling to abandon quantitative easing policies. If the currency of a nation declines meaningfully over a sustained period, it creates significant problems for that nation's economy. Inflation increases. There is pressure on interest rates to rise. Resources must be diverted from economic development and put into financial payments much of which could be sent overseas. External debt are the funds a nation, and its businesses and citizens, owe to lenders outside the home country. Using sources like the World Bank, the IMF and Wikipedia, one is able to develop a rough estimate of the external debt of 205 countries. If the estimates are correct, these countries owe $76.9 trillion in dollar terms. The biggest countries in Europe may have external debt of $40.6 trillion. The U. S. and Canada owe $21.4 trillion, overseas. Asia has $11.1 trillion with the remaining debt spread among counties across the globe who owe less than $25 billion apiece. A 1 percent increase in the cost of debt globally would result in a need to increase interest payments by $769 billion dollars. A 2 percent increase, which is close to what has been the rise in the effective Fe Funds rate, if spread globally, would force nations to increase their payments by $1.5 trillion. The point here is that persistent rate increases in the United States may be having very negative impacts on the global economy. When well over 100 nations see the value of their currencies drop it is highly unlikely that the United States can pursue its economic goals unaffected. In the mid-1980s when the Fed in the United States created a similar problem, the largest nations came together at the Plaza Hotel in New York and forced a change in approach. One must start thinking about a similar conference if the current trends continue. They cannot be ignored. The poet John Donne wrote many decades a go that "no man is an island." In a global economy, no nation is either.